Home > Holiday Specials > 3 DOZEN Metal Butterfly Garden Picks! That's correct, a special holiday 3 DOZEN Piece Set! Simple and sweet our assortment of small Butterfly Garden Stakes will bring color and delight to any home and garden. Sprinkle these butterflies in your flower pots, indoor plants, along walkways, balcony planters, and anywhere else you would like to expand your butterfly garden. Add some color and fun to your butterfly garden party! 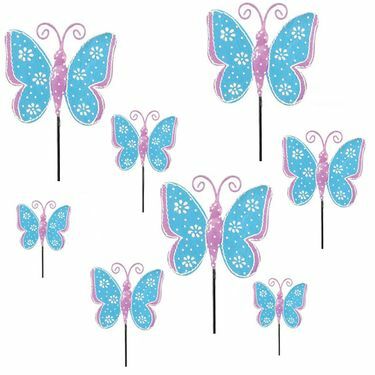 Set includes 3 Dozen Blue Butterflies. Made of metal, each hand painted with extra love and thoughtful care. Size: 3" Butterfly Wingspan, 14" Garden Pick. 3 DOZEN Metal Dragonfly Garden Picks!